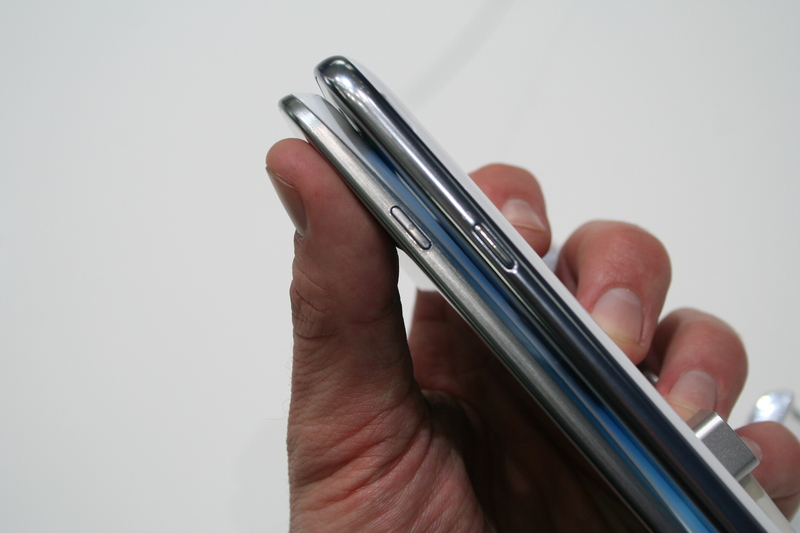 The most obvious change in the second generation Galaxy Note is its shape. 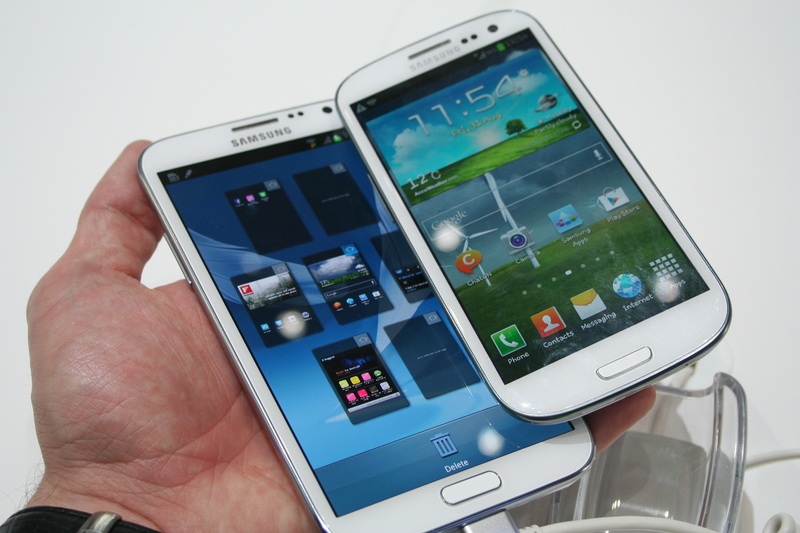 Using the Galaxy SIII as an obvious design inspiration, the Galaxy Note 2 has rounded corners and the same elongated central home button. Measuring in at 151mm long, and as you can see from the side-by-side photographs below, it really does look like the Galaxy S3’s bigger brother. There’s an upgrade in the size of the screen from 5.3″ to 5.5″, but despite this, the size of the handset hasn’t grown dramatically. It’s 151.1mm long, which is only 4.1mm longer than the original Note. 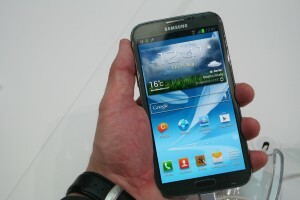 Its width has also been reduced to 80.5mm (down from 83mm) while its depth has also dropped from 9.7 to 9.4mm. It’s also not grown dramatically in weight, by only 2g to 180g and this despite improvements in battery from the 2500mAh version in the Note 2, to a Li-Ion 3100 mAh. Shipping with Android’s 4.1 Jelly Bean operating system, there’s a 1.6GHz quad core processor with 2GB RAM under the hood, which is a full 1GB more than the SIII. The phablet will ship in 16, 32 and 64GB options and also has an expandable micro SD memory slot to take its capacity even further. JK Shin, Samsung Electronic’s President of IT & Mobile Communications says that the Galaxy Note II will encourage its users to “unleash their inner creativity”. The enlarged HD screen and enhanced stylus pen suggest that this is more than a catchy marketing soundbite. In fact the stylus, which Samsung calls the S Pen, is where notable upgrades have been made. It’s longer, thicker and has been ergonomically designed for improved grip. There’s a new rubber tip, which is more dynamic and sensitive over the original S Pen. This makes the pen more precise, comfortable and gives a more natural drawing and writing experience. One of the problems many of our readers had with the Galaxy Note was keeping the S Pen close to their handset; we’ve heard many a story of the pen being lost! Samsung has taken this feedback on board and has come up with a solution for the Note 2. If the Galaxy Note 2 is more than three metres away from its S Pen, it will notify you, making the job of losing it that much more difficult. The handset will be shipping in Europe at the end of September and you can compare the best Samsung Galaxy Note 2 deals with Mobilesplease.